Cannot undo changes using German keyboard layout. (CMD+Z) shortcut doesn't work. The preconfigured Undo shortcut (CMD+Z -> CTRL+Z) has no effect when the keyboard layout in the virtual machine (VM) is set to German. Z and Y keys are swapped (yet the Windows undo shortcut is still CTRL+Z). Changing the undo shortcut, mapping to CTRL+Y in Parallels Desktop Preferences > Shortcuts also had no effect. All other shortcuts are working fine. 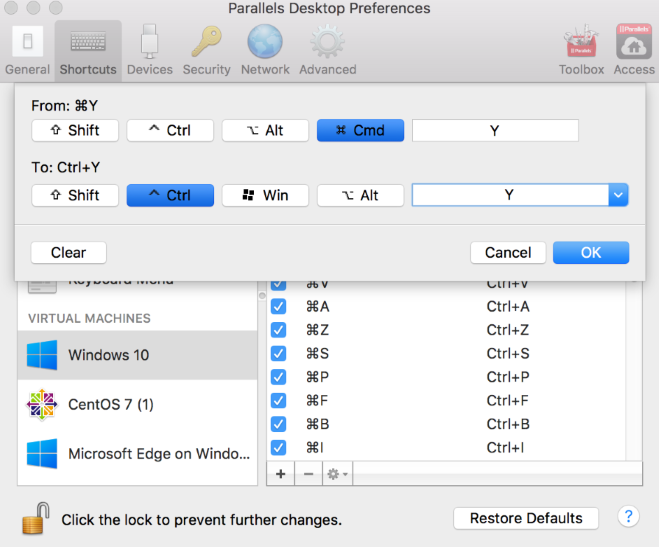 Parallels Desktop application configures the virtual machine's shortcuts based on the user's physical location. For example, for Germany Parallels Desktop will automatically set QWERTZ layout. To be able to use CTRL+Z shortcut to undo changes, please create a new CMD+Y -> CTRL+Y shortcut. In the appeared Preferences window find your virtual machine in the Virtual Machines list, on the right side find '+' to add a new shortcut. To apply changes press OK.